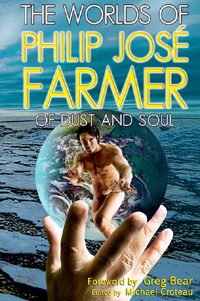 Meteor House is now taking Pre-Orders for The Worlds of Philip José Farmer 2: Of Dust and Soul. Order before August 1st and save $5 off the list price. Remember, The Worlds of Philip José Farmer is a Numbered Limited Edition, so if you already have Volume 1, you will get the same number of Volume 2 (and then Volume 3, 4, etc. when they come out). Volume 2 contains non-fiction by the likes of Greg Bear, Charles Platt, James Sallis, Thomas José Josephsohn, Edgar L. Chapman, and of course Phil Farmer himself. And fiction by Spider Robinson, Bradley H. Sinor, Jean-Marc & Randy Lofficier, Mary A. Turzillo, John Allen Small, and Phil Farmer himself, including a novella by Phil and Christopher Paul Carey set in the world of Ancient Khokarsa; a spin-off from their forthcoming novel The Song of Kwasin. And if you’ve been kicking yourself because you just never got around to buying Volume 1, there is a special deal just for you. You can order both volumes together for $7.50 off the list price of the pair (and then save even more with a reduced combined shipping charge). The pair of books—with matching numbers of course—will be shipped together once Volume 2 comes out in early August.